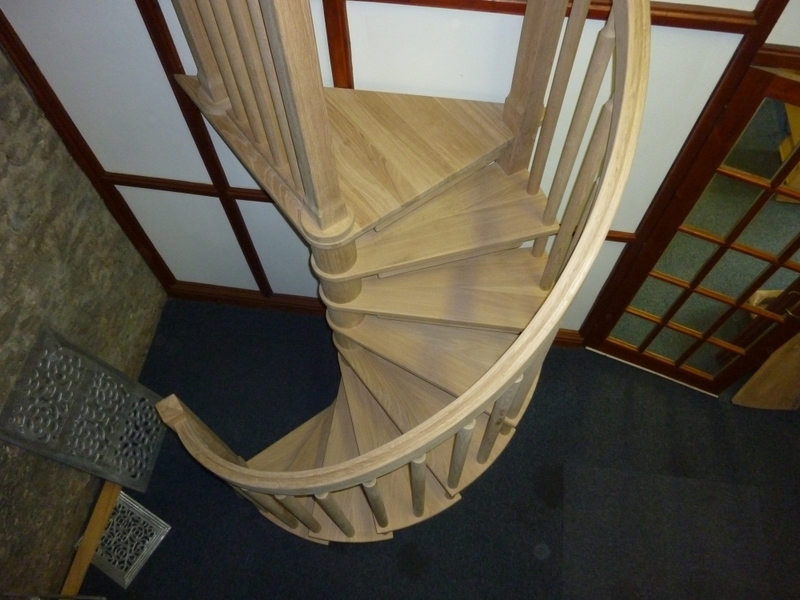 Since its launch in April 2011, the stylish Derbyshire range of wooden spiral stairs has been offering customers exceptional value for money when looking for a simple, bespoke staircase designed and built for their individual homes. This range was designed to meet the rising demand for quality but with a more contemporary looking spiral staircase. The Derbyshire range can be built in any diameter up to 1900mm and to any tread angle with no extra cost. The most popular timbers are Oak, Ash and Sapele but if you have any individual requirements please let us know. The spiral has a simple bobbin design with 3 baluster options, 70mm square newel posts and a 45 x 70mm handrail. The tread thickness is 32mm up to 1600mm diameter and 44mm up to 1900mm diameter. The treads are supplied in 1 piece compromising of a tread top, bobbin and riser, which makes assembly of the stairs on site straight forward. As with all our spirals we fully erect them in the workshop, including the housing in of the spiral handrail and any associated landing handrail into the newels top and bottom again reducing the amount of work required onsite. The landing balustrade is supplied in pre drill lengths with spacing between the balusters of no more than 100mm spaces to comply with current British Building Regulations unless otherwise requested. As with all our staircases, we have the ability to mix and match balusters to suit your personal preferences so the above is not an exhaustive list but just our recommendations as to what works best with the design.